Memoirs from an epic five-week photography commission in Iceland from December through to January. 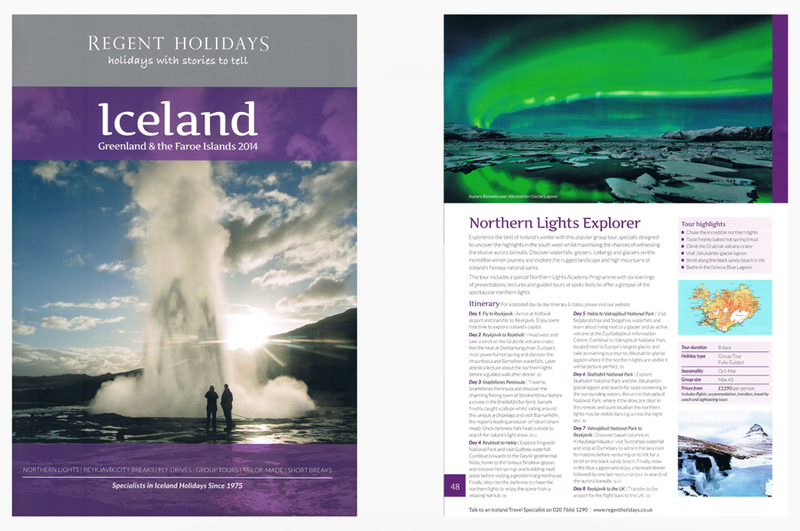 I provided several images, many for tour companies, ironically, some of which are still being used to this day, and three bespoke brochures for Greenland and Iceland, with another photographer, completing the Greenland work (damn); but I couldn’t complain! The entire trip was undertaken on the fly, booking accommodation and moving with the weather where possible. So, what can I say that has not already been said, probably not a lot, but I’ll say a little in case you have landed on this page unaware of the country of Iceland whatsoever! 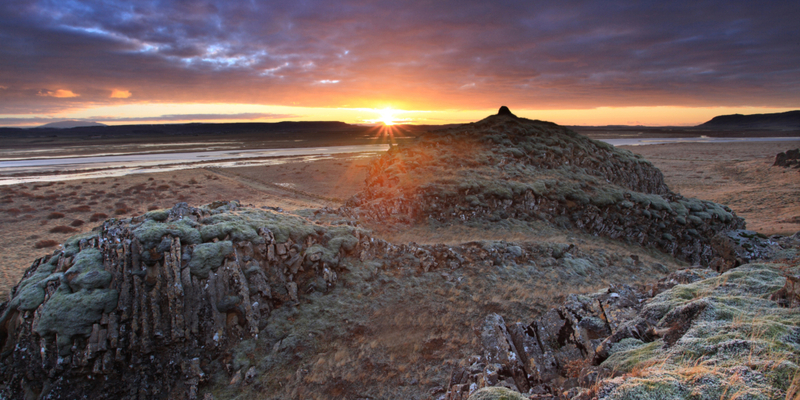 The Vikings founded it, though they say Irish monks had pilgrimaged there prior to this; now part of Northern Europe. The country is situated in the north Atlantic just below the Arctic Circle, so therefore It’s a cold country, although the Gulf Stream reaches its southern and lower western coasts; naturally bringing warm air into contact with freezing air from the Arctic causes very turbulent, erratic, and wetter weather. 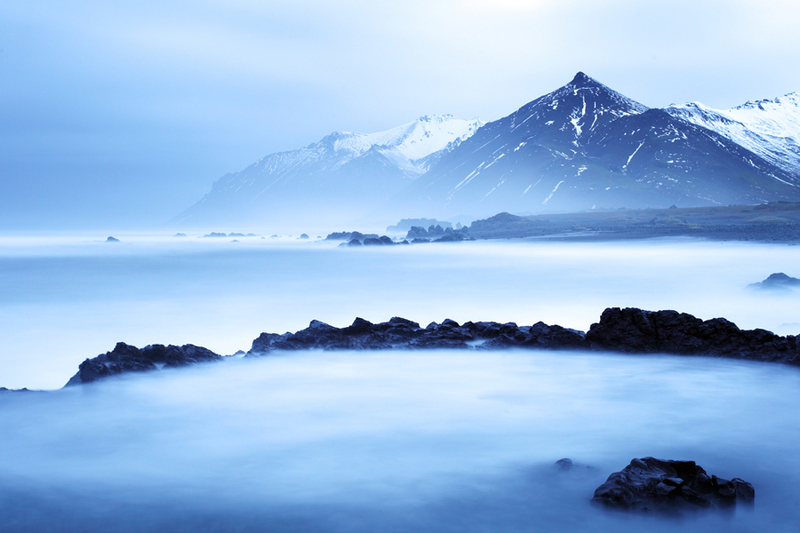 Its north west (West Fjords), north east, and north coast are regarded as having a slightly more stable weather system (with the emphasis on slightly), colder, and more are prone to snow cover. The country has a small population, it uses Krona as its currency. I run photographic winter workshops annually in Iceland that have a strong emphasis on night sky astrophotography as well as traditional landscape photography. The February 2018 one is now full, you can see read the details of the 2019 Iceland tour by clicking on the links below, or keep scrolling down for the rest of this travel blog. 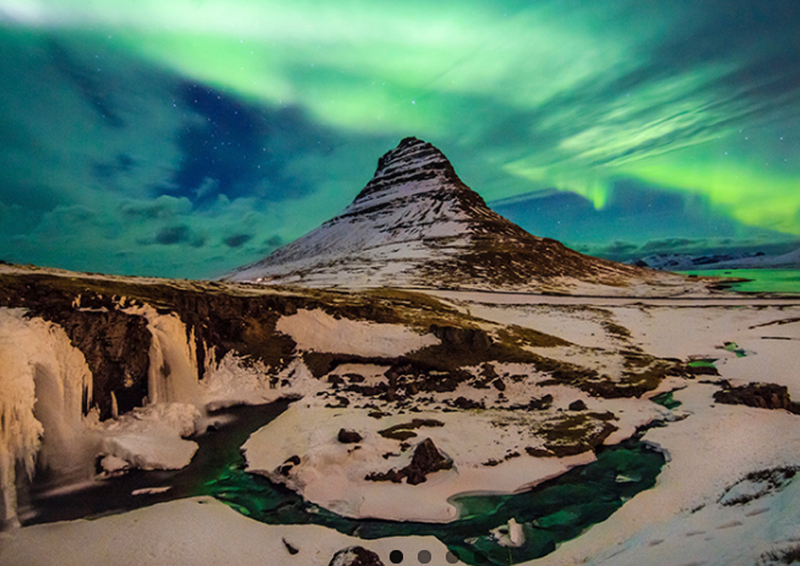 Capture Aurora and majestic landscapes in Iceland, whilst developing landscape astrophotography images with a noteworthy landscape photographer whose reputation was built not only on nightscapes, but also on pioneering landscape night sky workshops within the UK; in addition to becoming one of Europe’s leading landscape astrophotography workshop organisers and tutors. 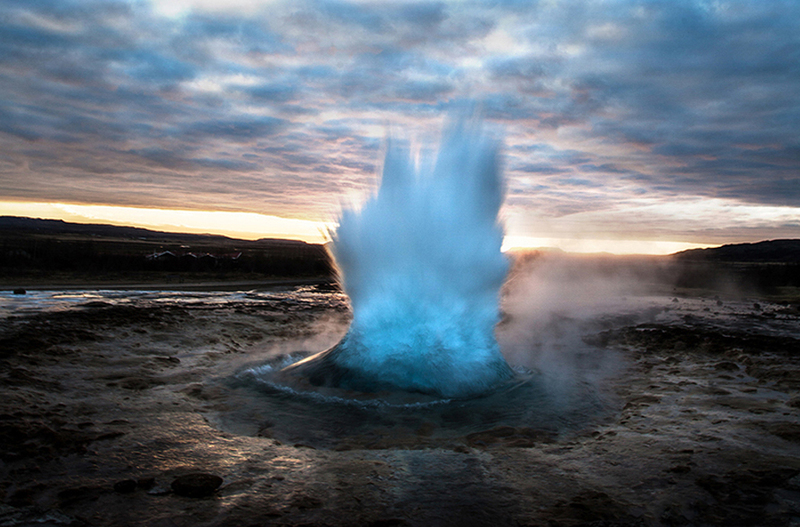 Iceland is the world’s youngest landmass and it is formed on two tectonic plates, the Eurasion and North American! Due to being situated on a point where these plates are colliding, it is prone to earthquakes; it is also heavily volcanic and the islands heat and power is sourced from this (geothermal heat sourcing as seen in image below). 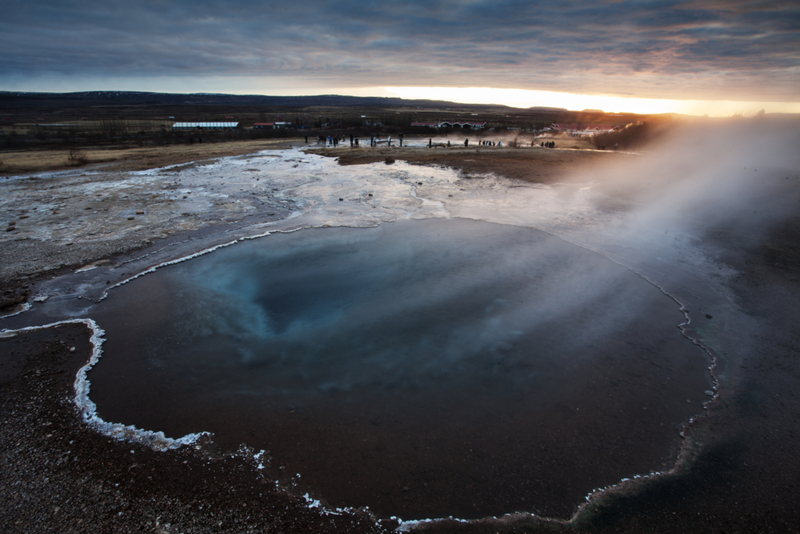 Iceland has over 20 active volcanos and an abundance of lava fields both old and new. It’s subarctic climate and impenetrable mountain ranges mean that it is home to some of the largest glaciers in Europe. It has canyons, geysers, hot springs, Arctic tundra, mountain peaks and deep fjords, not to mention hundreds, if not tens of thousands, of waterfalls, including some of the most breath-taking waterfalls in Europe, and certainly the most powerful (Dettifoss). Reindeer, Arctic fox, Icelandic horse, puffins, and occasionally polar bears floating in on Icebergs from Greenland! Seals, dolphins, and whales, including Orcas. The road is long? No doubt! And then some, but amazingly beautiful if you are blessed with light! In summer, during the solstice, the sun sets around midnight and rises again just before 3 am (Reykjavik co-ordinates) and in mid-December the sun only rises at 11.25 am and sets again around 3.30 pm; as the sun has such a low trajectory across the horizon, the hours of daylight are in constant golden hour, thus the mid-winter light is amazing and a landscape photographers’ dream. 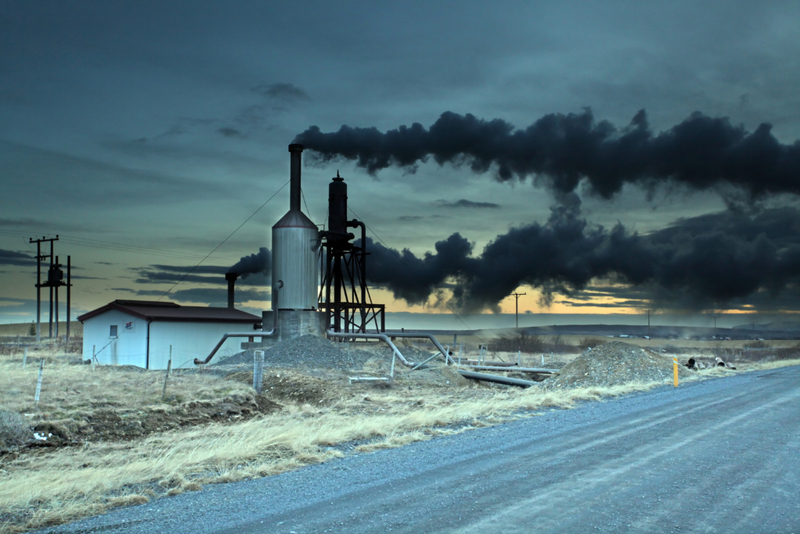 The Icelandic landscape is phenomenal, and although it can be problematic, especially on the photographer, its climate helps make it what it is. I found out all too well how the weather can work against you on occasions. After arrival, my first few days were spent in Reykjavik, I was greeted by rain and about 8 degrees Celsius into the first few weeks of December. The forecast didn’t change much over the next few days, in fact it worsened with pretty much the entire country under heavy cloud and rain (icy rain in the north). 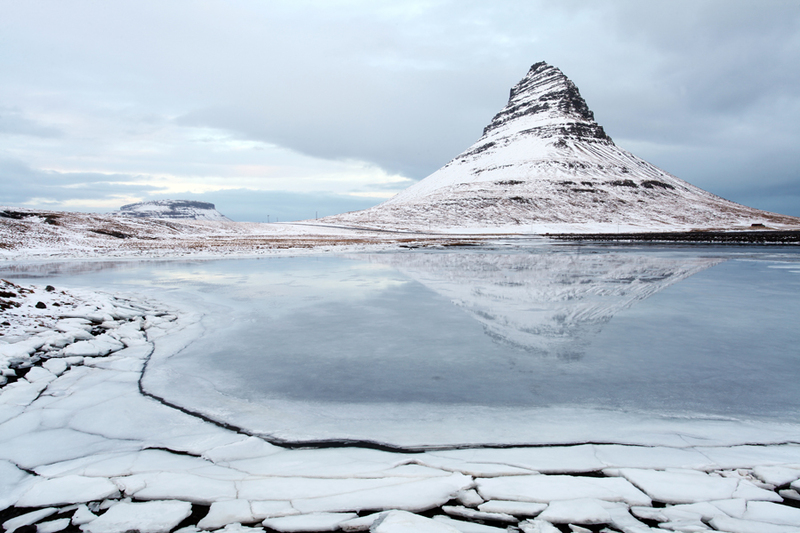 As my clients needed a shot of Mount Kirkjufell, I headed straight to the Snæfellsnes Peninsula. The image above was taken at sunset believe it or not, but it was bliss, I had Kirkjufellsfoss waterfall to myself. The problem is I spent five days here waiting on a change in weather as I needed an Aurora shot. It didn’t happen, and the moon grew brighter, and was up earlier. I headed south. Gullfoss was spectacular in size and the sheer, pure brute force was immense, but you could not get near it in the winter, the icy spray on the path was too much, and it was also too dangerous to venture down! At the top, you really don’t want to get to close to the river for composition, as it will probably be the last one you try and compose! It is also very popular with the tours, so there is a vast amount of people meandering around. However, I got lucky with the cloud breaking on the horizon for sunset. Base camp in the Golden Circle was near Skaholt, the plains around this area are vast with huge rivers, amazing mossy rock formations, mountains in the distance, spectacular sunrises, and not a soul in sight. Christmas Eve was one for the books, arriving at the hotel Booking.com had allowed me to take, at reservation somewhere near Skaftafell, it appeared deserted – and it was, they close for winter! It looked as if Christmas would be spent homeless, in sleeping bags, in the motor! I didn’t mind, maybe get another crack at shooting the Aurora which had been elusive, bar a couple of less than spectacular appearances. My ex-partner on the other hand was less than impressed. After driving to Hofn, and ringing a hostel buzzer, a very kind lady stopped her festivities, and drove across town to let us in. 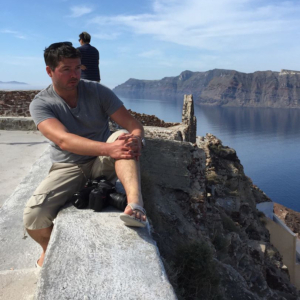 I was lucky enough to stay for several days in the Hali Hotel, which has become a photography workshop basecamp over the years and you will be very lucky to get a room there now, especially for a group. 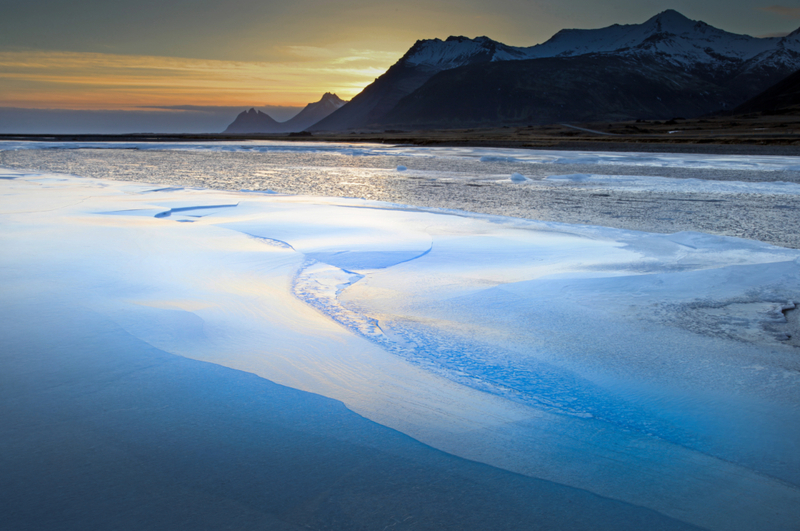 Just down from the hotel is a small lagoon that runs behind the natural dune separating it from the sea; this remains frozen and the ice formations coupled with sunrise and morning light are well worth a morning stroll and shoot. 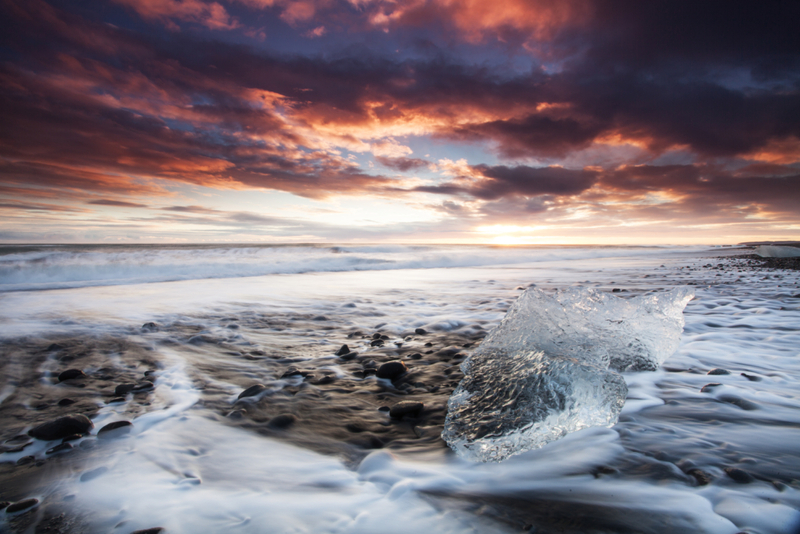 Jokulsarlon glacier lagoon and the famous iceberg beach or also referred to as “Diamond Beach”! 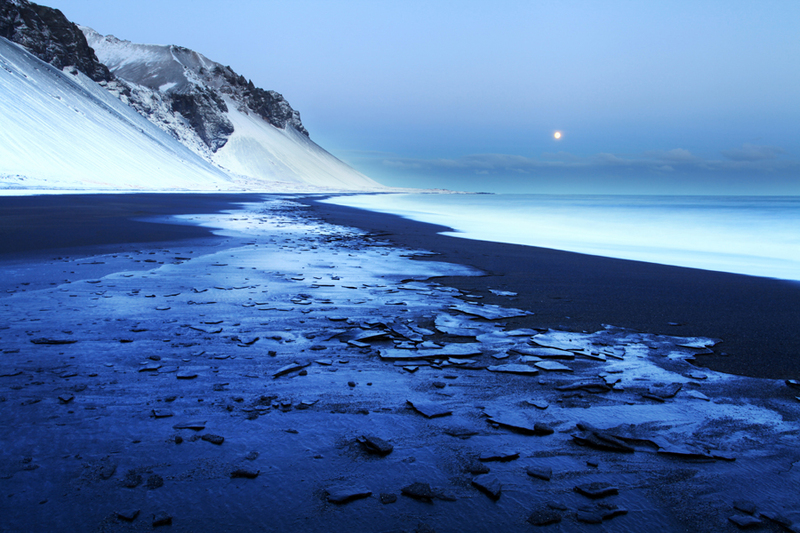 Be careful on this beach, as with the black sand beaches at Vik, rouge waves are common and people are dragged in each year caught unawares. There is no landmass for thousands of miles from Iceland’s south beaches, meaning waves can gather some serious momentum before breaking on this stretch of coastline. 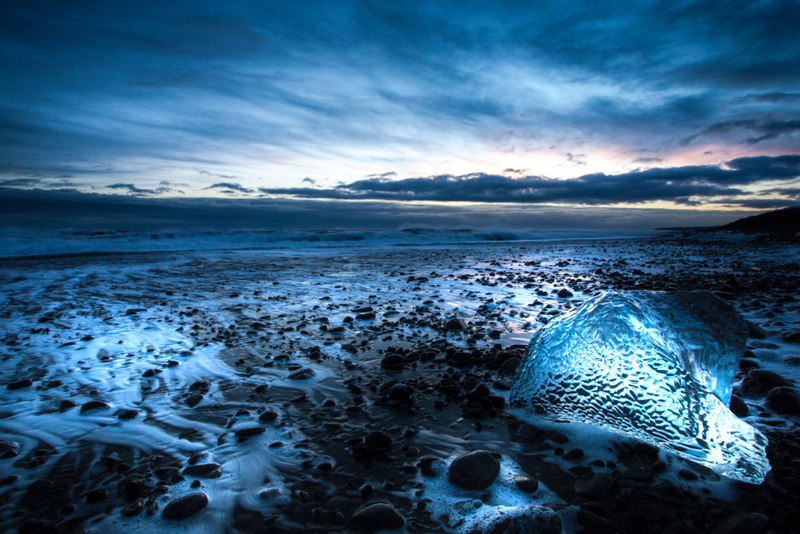 A stunning location that changes daily as the icebergs wash onto the beach from the lagoon, which is formed at the foot of a glacier and empties down a narrow passage and into the sea. You can easily spend several sunrises and sets on this beach looking for different compositions and using the differentiating light of each day, I visited a few times and favoured it over the lagoon. My client needed photos of the Icelandic East Fjords as a pre-requisite for the commission I was working, we are talking past Hofn and Vestrahorn, way in to the depths of the east! With Vestrahorn in the distance to the west, once again I began to venture into the unknown. 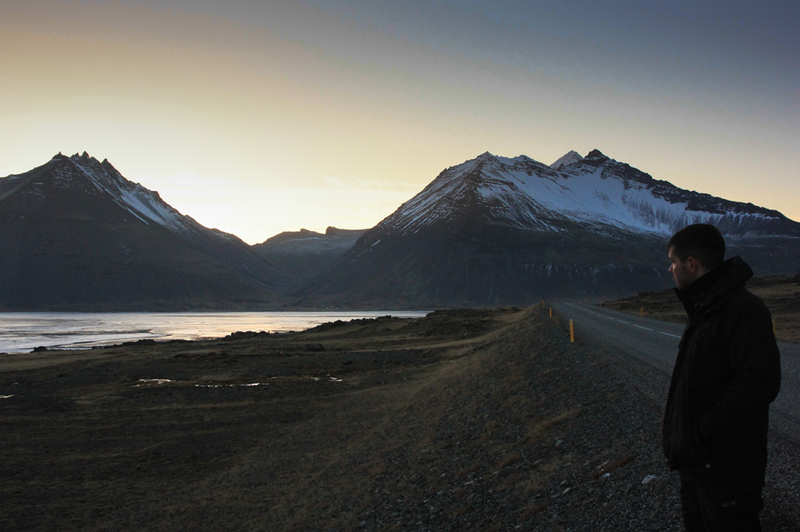 The East Fjords have such a different feel, no more than the occasional car here and there now, just steep snow-capped black mountains, occasional volcanic beaches, or sheer drops into the fjords. Frozen rivers, pure tranquillity, and a peacefulness I had never before experienced; I’m sure that first day after leaving Hofn, the only living things I saw were reindeer and a snow goose; this area really captivated me, more so than any of the key tourist landmarks and landscapes such as Jokulsarlon, Mount Kirkjufell, Gullfoss, Seljalandsfoss; you get the picture. After a few days, several shoots, and on almost reaching Egilsstaðir, perfect I thought, I’ll circumnavigate the country (something I had hoped to do) as I am going that far out, may as well see the north, I have a few weeks left! Did I mention the Icelandic weather earlier? And the east being more stable, but also prone to heavy snow?! I ended up turning back to try and drive back out of it, as it was soon up to the bumpers of the 4×4. The blizzard was so bad that visibility became nul point, so I pulled over. The snow ended up knee deep and it looked like it was to be a night in the car (naturally I had prepared for this, complete with Arctic sleeping bag). As the weather cleared later in the day, it was too deep to drive in, so, to pass the time, Eric was born! 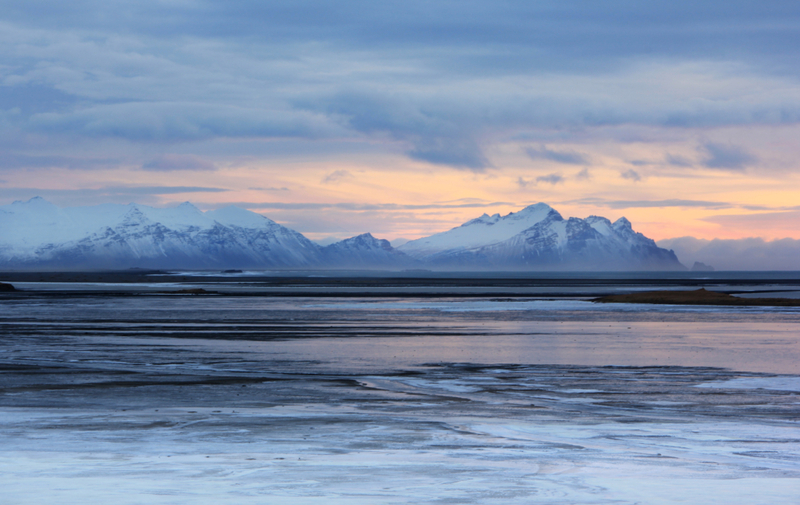 Not long after, a snow plough came hurtling down heading south westerly, and I took a detour to some close-by accommodation I found had vacancies at Eskifjörður. Here it snowed, and snowed, and snowed, and I happily took some rest for a few days in this little east coast fishing village that had turned into a winter wonderland. Heading back along the south coast, I witnessed one of the biggest swells I have ever seen, the Atlantic was raging! I used a Lee Filters Big Stopper, the old version that left a blue cast (I sorted the white balance, but left a blue tinge, I feel this suits cold, wintery locations) to create a silky smoothness to the water as it washed into a cauldron type pool before me. 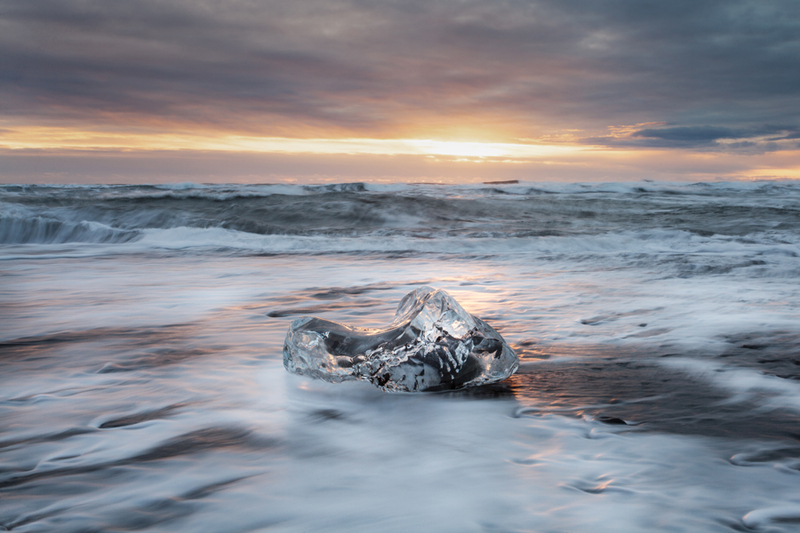 I couldn’t help stopping off at the iceberg beach again across from Jokulsarlon Lagoon. And finally, I had to drive all the way back to West Iceland and the Snaefellsnes Peninsula for the Northern Lights. I have been back to Iceland since, with an Icelandic friend, so the entire trip was not based around photography; though I did bag a handful of images that were of a higher standard than the ones taken on this trip, especially the Aurora shots, but this trip was winter 2011 and my nightscape technique was poor. So why the late post? It was this trip that was solely responsible for more venture into night photography, and a low-key style that I became renowned for in the UK a few years back, after a couple of years practice, I then went freelance full-time and commenced on a four-year onslaught from Land’s End to John O Groats and many nights in tents, cars and camper vans; pretty much coming to an end at the start of March 2017 after spending 10 weeks of the winter up in Scotland over two trips. But that’s another story, and a blog for a later date!! For nightscape and landscape workshops, both in the U.K and wider Europe, please see my workshop page here or my facebook business page.